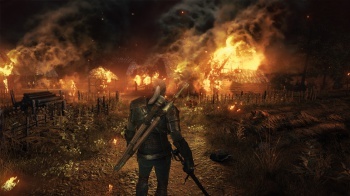 The Witcher 3: Wild Hunt isn't going to come out this year, but CD Projekt says it will be worth the wait. CD Projekt announced today that The Witcher 3: Wild Hunt will ship in February 2015 and not later this year, as had originally been planned. In an "open letter," the company said its goal for The Witcher 3 is to create a game that will properly "crown" the many years it's put into the franchise. It's an ambitious endeavor - the first two Witcher games were pretty fantastic, after all - and after looking at the current state of the game the studio decided to hold off on putting it out. "We could have released the game towards the end of this year as we had initially planned." it wrote. "Yet we concluded that a few additional months will let us achieve the quality that will satisfy us, the quality gamers expect from us." It's disappointing, but good news, too. It's hard to be cynical about CD Projekt, so if they say the extra time will be put to good use, I'm inclined to accept it at face value. More to the point, it's not a terribly lengthy delay: The Witcher 3 was initially slated to hit near the end of this year, so early 2015 only represents a wait of a few more months, a relatively minor postponement in the grand scheme of things.